What is the cost of the Santosha Level 2 500 hour Yoga Teacher Training? The cost of our training is AUD $3,390(or AUD $3,190 early bird discount if you pay in full two months early) This includes your tuition and certificate, but does not cover flights, food and accommodation. Cloaked with blue mists and nestled at the foothills of the Sahyadris, just 3 hours drive from Mumbai, lies this gorgeous Yoga and Ayurveda retreat, promising tranquillity and change of pace from the hurried life of the city. Once I have completed my Level 2 Training am I eligible for registration with Yoga Alliance? How long in the Level 2 300 hour training? The course runs over 28 days, including four days off. What experience/qualifications do you need for the Level 2 Yoga Instructor class? There will be bridging assignments to assist those who have completed their Level 1 200 Hours at a school other than Santosha. These can be purchased as books, or electronic downloads for kindle etc. A New Earth can also be purchased as an audiobook. Yes, once you enrol in the training you will be sent access to a Resource Centre with all the course materials and Manuals you will need for the training. You have the choice of downloading or printing these items to use during the course and beyond. It is possible to complete the course while pregnant, but we ask that the decision is made only with the consultation and full support of your doctor. Only they can advise if this is the best course of action for you. You must keep teachers advised of any physical ailments or issues arising from your pregnancy, so they can best assist you. What happens if you get injured or fall unwell and can't complete the training? We try our best to ensure even those who are injured or unwell can complete their training and receive certification at the end of the 28 days. There is also the option to complete some extra work upon returning home in order to complete the course, depending on what has been missed. In the case that you cannot physically finish the course we can refund funds minus the $350 AU deposit, or you are welcome to join the next intake of this course to finish your training with us. Are mats, blocks and straps provided? We provide blocks and therabands for our students so no need to bring these items. Please bring your own mat. What after training support is there? You will be given access to our Santosha Worldwide Yoga Teacher network, to post questions, get support and view international jobs postings as well as lifelong access to our resource centres and videos. We are also always available via email or skype to answer and additional questions which arise after your time on the course. We are available to support you at every stage of your journey. What would happen if I didn't meet the criteria to pass the final exam? How can I get certified? We will work to you during, and if necessary after the course to ensure that you are able to complete your assessments and leave the training with a Level 2 certificate. Yes! This probably means you are ready to step into something exciting but you just need that extra bit of courage to make the next brave step. You are welcome to write to us and let us know about this and we can happily provide extra support - both before and during your time with us on the course. Where is your 2017 Level 2 500 Hour training held? Where can I stay during my time? There are several options to suit all budgets onsite at the Ecovillage. We keep these separate at allow our yogis to make the best accommodation choice for their budget and needs. How much is Accommodation for the 28 days? This depends on the choice of room. Please see the Accommodation Guide for full details and costs. Full board including three incredible Ayurvedic Vegetarian meals a day will be included in your room price. How do I get to the centre from Mumbai? What are the Mandatory Items to bring to the training? Note: If you complete the Power of Now before you leave, you do not need to bring this book with you. How I do log-in to the student Resource Centre? It is up to you which option you prefer. Whatever you choose please read this carefully to ensure you have downloaded or printed everything you need. What Assignments do I complete before I come? All assignments will be covered and done in class except three. Of these three ONLY Power of Now is mandatory. We strongly encourage you to do the Anatomy Colouring and Samkhya for you own knowledge, but we will not be marking them and they are not mandatory. These assignments can be found in the Resource Centre. The Power of Now is due day 3 of the training, thought extensions can be granted. How do I hand my work in? Where do I find the Course Manuals? We can order printed manuals for you from our printer in Bali for $60 AUD. An email will be sent out about this with the Manuals one week before the training begins - please reply then and let us know you would like to order these and we will arrange for you. What time should I get to the island and when does the course start on Day One? Please organise your travel so you will be in the island and ready to begin your studies at 11am on the first day of your training. What if I cannot get to the island the night before my course begins? 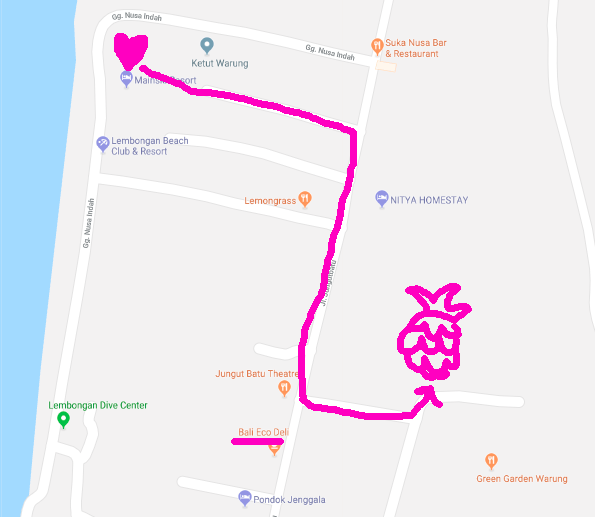 If you are not on the island by the night before your training you can still catch the morning boat across from Sanur (first D'Camel Boat leaves at 9:30 and arrives Lembongan at 10am) you may need to head directly to the Welcome Circle with your bags and then settle in your room later on! But you will still have plenty of time to make it across and in the first meeting at 11am. What time should I leave the island and when does the course finish on the last day? The Level 1 RYT-200 course ends at 5:30pm on the last day - and most students get together somewhere special afterwards for a celebratory meal and goodbye. As boats do not leave in the evening, you will want to plan to leave the island the morning after the last day - or you may choose to stay a few extra days and attend our extra PPNCT or Yin Yoga trainings. What should I bring to the 11am Welcome Circle on Day One? - Your schedule will be emailed to you 5 days before your training begins and also will be on the wall outside the shala. Please bear in mind this is a living breathing document! Changes may occur organically during the course, we will keep you informed of anything that arises. What if I would like to order Printed Manuals? We will send an email about the option to order Printed Manuals 10 days before your training begins – please wait and do not email prior to this. If you ordered printed manuals staff will be at the Welcome Circle to hand these out and take payment. Please have your local currency or $AU ready. No money, no manual! When can I find out about extending my Visa? What Vaccines do I need for the trip? As we are not doctors, we prefer to refer to those who are for this question - the below link advice from Travel Doctor is a good place to start. If you find you still have any concerns, please chat to your doctor or a travel doctor in your area. Like the rest of Bali Nusa Lemongan is officially a Malaria free area. However anti malarials may be necessary if you are traveling to other parts of Indonesia, so please consult with your doctor beforehand if you plan to do this - or if you have any doubts concerning your travels. Are there Mosquitoes in Bali and Sri Lanka? What is the best way to avoid illness? Sometimes caused by bacteria found in local foods or drinking water but most often caused by an increase in exotic foods, too much food or an increase in alcohol intake, Travel Belly is treatable and will usually clear itself up sometimes within 24 hours, other times is may take a couple of days or even up to a week. I have an injury, will I be okay to attend? As long as you work to your own level - resting whenever you need - and let the teachers know if any health issues arise, then you will have no trouble with the classes. We have had injured students complete the training many times. We find that these students actually do better, as they end up having a greater understanding of working within the limitations and considerations of the individual's body. Please inform us as soon as you can with regards to any injuries. Our teachers are trained to take injuries into account and will teach accordingly, but the more warning we have the more information we can gather to best assist you. It is also your job to speak up and let your asana (and postures) teacher informed if conditions worsen or change. As long as you work to your own level - resting whenever you need - and let the teachers know if any health issues arise, then you will have no trouble with the classes. We have had injured and pregnant students complete the training many times. We find that injured students actually do better, as they end up having a greater understanding of working within the limitations and considerations of the individual's body. Is the tap water safe for drinking in Bali and Sri Lanka? Is there a Doctor/ Hospital on the island ? Please contact Santosha prior to the training if any concerns arise due to illness or injuries. We need to be informed so we can best assist and support you during the training. As we are on an isolated island with limited medical facilities we need to ensure the safety of our students during their time with us. Although our teachers are supportive and caring individuals, they are not trained psychiatrists or psychologists and are not qualified to give support beyond the​usual stresses that come up during our student's time. We need to know there is a professional who you are able to ask for additional support beyond the capabilities of our teachers if need be. I am pregnant, can I still attend? Our Nusa Lembongan trainings are held at Yoga Village Nusa Lembongan - our shala on the beach. Where is Yoga Village Nusa Lembongan? Yoga Village Nusa Lembongan is located on the beach above Ginger + Jamu cafe. How do I get to Yoga Village Nusa Lembongan? We recommend booking.com for ease of booking your overnight stay if necessary. We recommend you catch a Fast Boat as it takes only 20 – 30 mins and all Fast Boats include drop-off at your hotel on Nusa Lembongan. Our recommended Boat Company is D’Camel - they offer a $20 AUD Santosha discount! Packages include pick-up from south Bali (Kuta etc) or Airport and transfer to your hotel in Nusa Lembongan - door to door service! If you do not want to use the Santosha discount, there are other boat companies including Scoot and Rocky. A quick google should find them for you. All Fast Boats include a free drop-off at your hotel on Nusa Lembongan via mini-van. What if I arrive late into Bali and cannot catch a boat until the next morning? What time should I get to the island and when does the course start on Day 1? What time should I leave the island and when does the course finish on Day 25? Flyus.com is a good site to look for flight deals. We recommend looking for deals here and then booking them directly on the airline's website (to avoid Flyus fees) If you do not feel confident booking flights yourself, then contact your local Travel Agency such as Flight Centre. How do I book Travel Insurance? What Plug will I need for Bali? 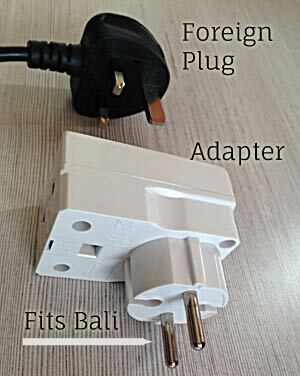 In Bali and Indonesia you can expect the 2 pin socket and plug as used in larger parts of Europe. The pins are round, not flat or rectangular. If you come from Australia, Japan, USA, Malaysia, UK, Canada, Singapore, and some countries in Africa you will most likely simply need a plug adapter otherwise the plugs for your electrical appliances will not fit into the "Bali Socket", although the voltage should be o.k. What do I need for travel to Bali? How do I get the Visa I need? This information will depend on whether you wish to stay less than 30 days or more than 30 days. Most visitors to Bali staying less than 30 Days can get a Free Visa Waiver (exemption) on arrival - meaning they pay $0 and do not have to pre-arrange anything. Please check the link below if your country is listed under the 140 countries that have this visa exemption. If so, then you only need to worry about your length of stay. Below 30 days is no problem. If your country is not listed then you need to apply for a Visa with an Indonesian Embassy or consulate abroad (outside of Indonesia). Make sure to pay closer attention to the date of your stay and ensure it is 30 days or less. Currently the overstay fee is 300,000 IDR (approx $30 AUD) per day - will soon increase to 1.000.000 IDR per day (approx $100 AUD). 2. Purchase a paid 30 Day Visa (not free Visa Waiver) on Arrival when you arrive in Bali, and then extend it a further 30 days once there. Google: ’60 Day Visa Indonesia + [your country] to obtain the specific details of obtaining this Visa. Many students have found that their Travel Agent (eg. Flight Centre) was able to assist with the process, making it much easier and stress free. We advise doing this. Please note: if you wish to extend your visa you must get a paid $35 USD Visa on arrival. Do not accept the free visa as it is not available for extension. Once you have purchased your 30 Day Visa (not the free Visa) upon arrival for $35 USD then you go to class one immigration (near airport) to apply and extend for the remaining 30 days. For the immigration department when you apply. You may need to spend some time visiting the Visa office on your day off – be prepared for travel to Denpasar. Bali and long waiting time if you chose to extend. It will take at least one day of your time in Bali to visit the office. You will get it done in two weeks - does not include Saturday and Sunday. It might be ready before your visa expires, depending on the time you give the passport. 3. After you have decided when and where to meet up, she will pick up the passport(s) and let you know in 4-5 workdays when you need to come to the Immigration Office for the photo and fingerprints. 4. Make sure you arrange the trip nicely. Book your ferry ticket and book the driver to take you there and back. It is safe to keep the passports with the agent. Either way, you can set up the best way how to pick up the passport when you are on the mainland again. The red circle is the sticker you will get when you buy VOA (USD 35) at the check-in. That green stamp is MANDATORY TO HAVE. Valid for 30 days. 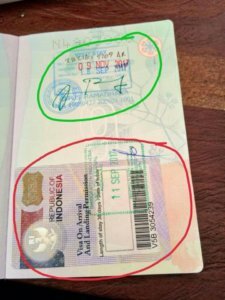 The green circle is the extended visa (one time only), with the Extension Stamp, which makes it valid for another 30 days. Please make cop(ies) of your passport just in case you will need it. What is the cost of staying onsite? Rates above are quotes only based on our recent conversation with the venue. They may change, so please confirm when booking. What are the onsite rooms like? You can view the rooms here - however please do not book via this site - book directly with Maya for the Santosha room rate. Can I stay offsite to the training venue? Of course! We provide recommended guesthouses nearby our training venues in our Accommodation Guide - or you can make your own plans using sites such as airbnb or booking.com. Can I email Santosha to book my accommodation? How close should I be to the shala? We recommend checking with your hotel beforehand if you can use a credit card to pay, as most places in Bali are cash only. In this case, make sure you have enough cash handy to settle your bill at the end of your stay. Will my room have wifi? Where can I eat on the island? How much is food on the island? How much you spend will depend where you choose to eat. Local “warungs” can cost between 10,000 - 20,0000 IDR a meal; western style establishments will be around approx. 50.000 - 100.000 IDR for a meal, not including drinks. Fresh juices are readily available at around 20.000 - 30.000 IDR. How much is food on the island - AUD? Local “warungs” can cost between $1 - $3 AUD a meal; western style establishments will be around approx. $5 - $10 AUD for a meal, not including drinks. Fresh juices are readily available at around $2 - $3 AUD. How much is food on the island - USD? Local “warungs” can cost between 70c - $2 USD a meal; western style establishments will be around approx. $3.50 - $7 USD for a meal, not including drinks. Fresh juices are readily available at around $1.50- $2 USD approx. I am on a tight budget, what is the lowest I can spend? If you budget well and eat local, you can spend as little as $10 AU ($7 US) a day on meals, which over 25 days would be $250 AU ($180 US). Note this would be simple local food and not include alcoholic beverages, lattes or fancy meals out! I am a Vegan - can I eat on the island? Yes, very much so! Our onsite cafe Ginger + Jamu has many tasty Vegan options. Bali Eco Deli and Rama Garden nearby also have vegan options. If you still find it a struggle with those options, please let out cafe manager and chef Jamie know and he can add some extra vegan options for you. I am Gluten Free - can I eat on the island? Yes, very much so! Our onsite cafe Ginger + Jamu has many tasty GF options. Bali Eco Deli and Rama Garden nearby also have GF options. If you still find it a struggle with those options, please let out cafe manager and chef Jamie know and he can add some extra GF options for you. Some local dishes are also naturally GF, though watch for sneaky ingredients like soy sauce. Can I still get my daily caffeine fix? I would rather make my own dining decisions, can I have eat off-site? Of course! We would love to see you in the cafe, but you are welcome to make your own decisions about where you eat . Where can I buy fresh fruit and snacks?